Ruanel: The monuments of the Mayan civilizations, Inca and Aztec, have been built in their majority by extraterrestrials, in the same way like those Aliens from Orion 3 built the Pyramids of Egypt. What it is necessary to find out since I have not the fact at this time. It is what alien race collaborated with those three civilizations. Interlocutor: Was their disappearance due to the alien abduction also, maybe to colonize other planets? Ruanel: Yes, I confirm it to you. The extraterrestrial intervention in the Mayan, Inca and Aztec civilizations is logical, because it’s not acceptable that a supposedly advanced civilization, able to build so many marvels, was capable at the same time of sacrificing maidens to appease to the "god of the volcano." The only valid explanation is that on one hand there were advanced extraterrestrials and on the other hand there were the primitive inhabitants who were those that truly practiced those sacrifices. In the same way, the Egyptians also made human sacrifices, but it would be illogical attribute to them the construction of the pyramids. Interlocutor: Could it be a parallelism with regard of the Alien intervention and what happened to the Israelites when the extraterrestrial race of the Ha  contacted with them? Ruanel: Actually no, because the Ha were tremendous predators and they put in war to the tribes due to their own selfish purposes. The Israelites represent on the Earth the people who have massacred the most of all the nations. Interlocutor: Did the Inca, Mayan and Aztec civilizations arise after the alien intervention or they were before? Ruanel: Those civilizations arose after the colossal extraterrestrial constructions. 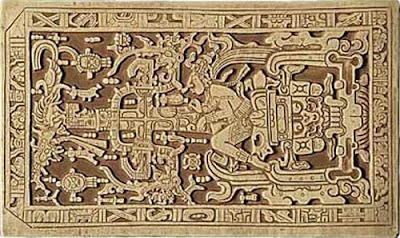 Interlocutor: The so-called figure "the Palenque Astronaut" was sculpted by terrestrials or extraterrestrials? Ruanel: It was made by terrestrials and it really represented an extraterrestrial astronaut. Interlocutor: What was that “feathered serpent” or the “Aztec god"? Ruanel: It was only extraterrestrials who disguised themselves to impress the people. This entry was posted at Wednesday, August 19, 2009 and is filed under Lost Civilizations . You can follow any responses to this entry through the .